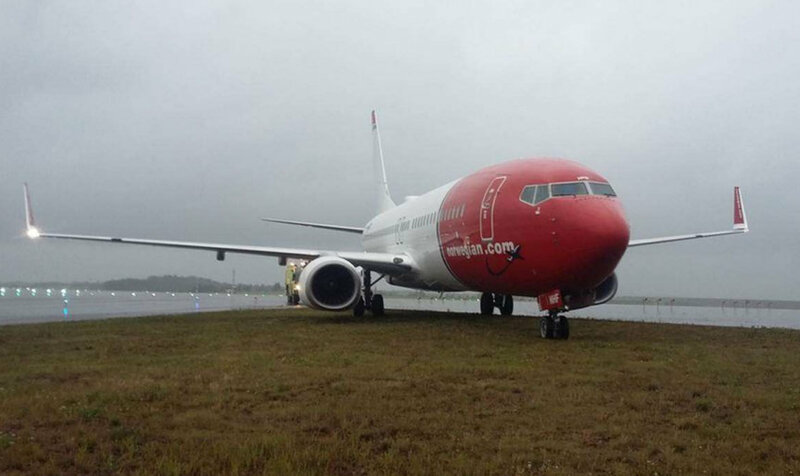 Boeing 737-800, LN-NHF, operated by Norwegian Air Shuttle overran the runway on landing at Helsinki-Vantaa airport on July 11, 2017, and came to a halt on the grass beyond the runway end. The aircraft departed 53 minutes late, the crew used higher than normal speeds to catch up with the schedule. The touchdown was light and slightly beyond the normal touchdown point. Due to excessive speed Captain decided to pass high speed turnoff WK and deselect braking systems. At 570m from runway end, Captain began heavy braking at 64kts. Captain then tried to turn aircraft to right onto taxyway. Due to excessive speed, aircraft did not turn sufficiently and aircraft departed from paved area into grass. At 1523 h UTC on Tuesday July 11, 2017, flight NAX4287 operated by Norwegian Air Shuttle departed from Arlanda Airport, Stockholm, on a service to Helsinki. The captain was pilot flying. The en-route portion of the flight was normal. The flight crew assessed the landing distance for the prevailing conditions and conducted a briefing on the essential aspects of the approach. The assessment of the landing distance was based on an ATIS message in effect for the aerodrome. The aircraft left the cruise altitude at 1546 h to commence an ILS approach to Helsinki-Vantaa airport. The initial approach to runway 04L was normal. Rain clouds were present in the area and winds were moderate. The touchdown was light and slightly beyond the optimum touchdown point at an airspeed that was almost right for the prevailing conditions. The captain selected reverse thrust at the moment of the touchdown, and reverse thrust became effective three seconds after the touchdown. The speedbrakes (spoilers) had been armed, but due to the light touchdown they did not deploy automatically. The captain deployed the spoilers manually one second after the touchdown. The autobrake system had also been armed and began to decelerate the aircraft normally upon spoiler deployment. During the approach, the flight crew had planned to vacate the runway via high-speed turn-off WK. Due to the high speed, the captain elected to pass turn-off WK and vacate the runway via a taxiway at runway end. The captain canceled reverse thrust, and moments later also stowed the spoilers and deselected the autobrake system, which resulted in a marked reduction in the rate of deceleration. The captain applied light and full manual braking with approximately 850 and approximately 570 meters of runway remaining, respectively. As the aircraft approached taxiway WH with approximately 300 m of runway remaining, the captain reselected reverse thrust and continued to apply heavy wheel braking. At this point, the aircraft was traveling at 64 kt (119 km/h). Because the captain had stowed the spoilers previously they did not deploy automatically. The captain attempted to steer the aircraft onto taxiway WD, which is the last taxiway at runway end. The captain canceled reverse thrust when the aircraft was traveling at approximately 25 kt (46 km/h), but due to excessive speed was unable to turn the aircraft onto the taxiway. The first officer called “brace” via the passenger address system. The tires impacted the runway light fixtures by the time aircraft heading had diverged approximately 20 degrees from runway 04L heading. Both nosewheels and three mainwheels came to rest on the grass while the fourth mainwheel remained on the paved area. The captain elected to not evacuate the aircraft. The air traffic control declared a local standby phase, and aerodrome rescue service units secured the aircraft. The aircraft was moved off the grass by a pushback tractor and towed to a position in front of the terminal building. In accordance with regulations, airport maintenance units inspected the runway after the incident. The runway remained closed for about one hour. There were no indications of fire and the captain did not order an evacuation. External steps were brought to the right front door of the aircraft. There were no injuries to the passengers or crew. The aircraft was removed out from the soft area by towing it from the back using cables on both main landing gears; since the airport was not equipped with a tow bar. The aircraft moved to the parking area using its own power from engine No. 2 since engine No. 1 sustained damage on its fan blades due to ingestion of small gravels from the soft area. Aircraft recorders (DFDR and CVR) were removed for the purpose of investigation. The incident did not result in injuries to persons. Runway 04L was wet from heavy rain. ATIS information indicated that 1 mm thick water patches were present on the runway. The flight crew estimated that the amount of water on the runway was larger than indicated. The flight departed Stockholm 53 min behind schedule. It had already been delayed during the departure from Helsinki, and the delay had since accumulated. Aircraft turnaround times at airports are short. During the short time available, the passengers disembark and new ones board, and the aircraft is fueled, loaded, and cleaned, and a delay in any one of these operations may easily result in a late departure. Norwegian's manual states explicitly that the goal is for 90 % of flights to be punctual within 15 minutes of the scheduled time since punctuality is an element of good customer service. All airlines operate in a competitive setting and have therefore set punctuality goals. Delays also incur additional costs to the airlines. laid down in the company manuals. The delay had been reduced by a few minutes by the time of landing at Helsinki. Norwegian’s Organisation’s Management Manual (OMM) states that the company's two operational priorities are safety and service. The aim of customer service is to offer low prices, good service, and punctuality. A strive for punctuality or the minimizing of delays may contradict with safety aspects. vacating the runway. At approximately 90 kt, the captain stowed the spoilers, canceled reverse thrust, and deselected the autobrakes. Company manuals contain no standard phraseology for the stowing of the spoilers and cancelation of reverse thrust during landing, yet good airmanship presupposes that a flight crew member notifies the other flight crew member of these actions. This maintains situational awareness of both crew members. 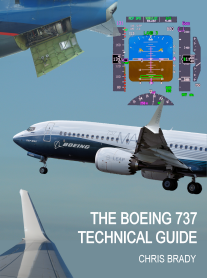 The company manual states that the computer software that flight crew members use to assess landing distances is based on the spoilers and reverse thrust being in use until speed has reduced to 60 kt. The deselection of the braking systems resulted in a low rate of deceleration. Colored lights positioned along the runway provide information on the remaining runway. The captain initiated light braking at approximately 80 kt with 850 m of runway remaining. The captain realized the situation too late and could not reduce speed sufficiently to turn the aircraft onto a taxiway. 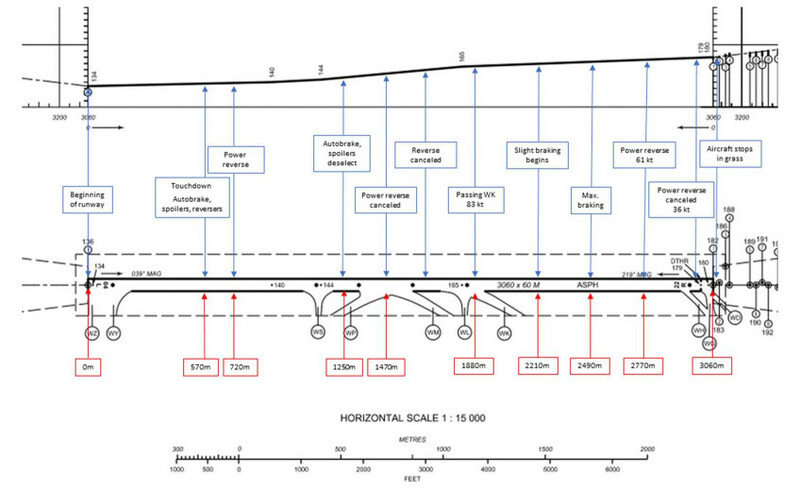 He applied heavy braking when the aircraft was traveling at 74 kt and with 570 m of runway remaining. Investigation showed that the airplane was not in a dynamic aquaplaning condition during braking. Some viscous aquaplaning always occurs on a wet runway. The experienced captain was familiar with Helsinki-Vantaa airport. The flight crew was satisfied with the expeditious landing until the aircraft was approaching the runway end. They did not adequately anticipate and take into account the wet runway conditions. Water that was present on the runway reduced friction and consequently the rate of deceleration during the final phase of brake application. Since the captain had stowed the spoilers, the braking distance was extended. Deficiencies in flight crew communication during landing were noted. The captain did not notify the first officer of the deselection of the braking systems, and the first officer did not react to the captain’s actions. According to standard communication procedures, the first officer shall only call out the deselection of the autobrake system, and the captain should confirm manual braking in use. Good airmanship, good crew resource management, and good situational awareness include the calling out of all actions that affect the flight. There was a significant experience gap between the first officer and the captain. It should have been the first officer's obligation to intervene when he noticed a hazardous situation developing, but he remained confident in the captain's experience and aircraft handling skills. However, during the final phase of the incident sequence the first officer notified, on own initiative, the cabin of an impending impact. Good airmanship presupposes, among other things, good crew resource management and that all cockpit crew members maintain an awareness of the speed and position of the aircraft and of the prevailing conditions. These requirements were not fully met on the incident flight. The captain continued full manual braking and reselected reverse thrust with approximately 350 m of runway remaining. Reverse thrust became effective after a delay due to the time required for thrust reverser deployment and engine spool-up. The spoilers did not extend automatically since the speed was below 60 kt at the moment reverse thrust became effective. The flight crew could have extended the spoilers by operating the spoiler lever manually but they did not do so. The captain managed to steer the aircraft towards the taxiway; however, the turn was too shallow and the aircraft departed the paved area. It came to a halt smoothly, and all occupants remained uninjured. incidents since this would increase the workload for the reporters and the authorities and might clog and obscure more significant safety items. On the other hand, the OMM mentions root cause analysis and states that one of the safety aims is to identify the root causes of accidents and serious incidents. This is contradictory to the concept of not encouraging occurrence reporting. Recurrent anomalies, even though they may appear minor, may be important indicators of root causes and a company safety culture. The manual also describes a procedure for anonymous reporting, called ‘whistleblowing.’ Anonymous reports are submitted direct to the authority. However, the preferred method of reporting is via the company’s SafetyNet reporting system. Competition and financial reasons have led airlines to set stringent schedule adherence goals. Some flight schedules may even be unrealistic and turnaround times excessively short, which deprives the employees of the possibility of achieving these goals. It is also probable that the employees of companies engaged in the industry are aware of the fact that each lost minute incurs additional costs to the company. Balancing in between the schedule adherence goals and the safety goals may lead to the adoption of procedures that undermine safety. Repeated delays and failures to attain the required punctuality frustrates the employees; if allowed to continue, frustration will lead to negligence, which may manifest itself in noncompliance with rules and procedures. 1. The flight departed Stockholm for Helsinki 53 min behind schedule. It had already been late on arrival at Stockholm. Conclusion: Competition and financial reasons, among other factors, have led airlines to set punctuality goals. A strive for punctuality or the minimizing of delays may contradict with safety aspects. If a punctuality goal cannot be met, attempts will be made to minimize the delay since each lost minute incurs additional costs. 2. Since the airplane was traveling at a high speed, the captain elected to pass high-speed turn-off WK. The flight crew aimed at vacating the runway via taxiway WD at the runway end. The distance to this taxiway intersection was approximately 1,200 m. The captain deselected the braking systems, and the aircraft continued down the runway at a speed that was high in view of the prevailing conditions and position. Conclusion: Due to the possibility of other traffic and punctuality goals set for flights, flight crews attempt to vacate the runway as soon as possible. 3. Colored lights positioned along the runway provide information on the remaining runway. The captain initiated heavy braking too late and could not reduce speed sufficiently to turn the aircraft onto the taxiway. The captain did not anticipate the effects of the wet runway and stowed spoilers on the braking distance. Conclusion: Flight crew members must maintain situational awareness until the very end of a flight. 4. Deficiencies in flight crew communication during the landing roll were noted. Conclusion: Deficient communication may contribute to degraded situational awareness. 5. Flight crew actions and crew resource management during the landing roll were not in accordance with the company’s standard operating procedures. Conclusion: Adherence to standard operating procedures is the cornerstone of safe flying. 6. The first officer had been recently hired by the company. The first officer did not explicitly indicate concern over the available runway. The first officer notified the cabin of an impending impact on own initiative. Conclusion: Employees recently hired by organizations may hesitate to intervene in unexpected situations. Organizations should emphasize the importance of good crew resource management during all phases of the flight. 7. Speed during the overrun was low, and the incident did not cause injuries to persons. Conclusion: Runway excursions rarely have catastrophic consequences. Good crew resource management (CRM) is an essential contributor to flight safety. Pilots’ basic training and recurrent CRM training emphasize, among other matters, the importance of standardized communication and a preparedness to interfere with situations that are felt to involve a potential safety hazard. Most serious incidents occur on runways and taxiways. Investigation into this particular incident revealed a lack of appropriate CRM-related communication between the flight crew members during the landing roll, which affected their vigilance and situational awareness. Competition and financial reasons have led airlines to set punctuality goals. Flight schedules may even be unrealistic and turnaround times excessively short, which deprives the employees of the possibility of achieving the punctuality goals. Recognized schedule pressures may affect their work in a manner that degrades flight safety. An earlier study (Eurocontrol, 2015) has shown that delays in commercial aviation are increasing. EASA has published on its website safety material on CRM training implementation. In addition, EASA has organized workshops on CRM-related matters for the responsible staff of airlines and national aviation authorities. The workshops took place on November 1, 2016, and August 29–30, 2017. EASA has carried out a study on runway excursions. One aim of the study was to identify means to improve regulatory action pertaining to runway safety, runway surface condition assessment, and occurrence reporting. EASA issued a document on runway surface condition reporting on January 18, 2018. EASA investigates how CRM training for ground operations can be enhanced.